There should be one authority, or at least a lot less authorities. And 25 toll roads is not enough. There should be at least 250 of them. AFAIK, the technology is the same in KS, OK, and TX--Transcore 6B/6C. There is an existing interoperability agreement that has been signed by KTA, OTA, NTTA, HCTRA, and whoever represents TxTag (TxDOT turnpike division?). (Wxfree dug it up a year or so ago and posted the link.) My best guess as to why OTA doesn't implement it is a nearest-neighbor problem. The agreement is structured so that tolls incurred by foreign transponders are passed through an interoperability hub that is owned and operated by NTTA, which skims off a fixed amount and a set percentage from each toll (either 3c and 5%, or 5c and 3%--I forget which). It also prohibits transponder discrimination (local and foreign transponders are assessed the same tolls for the same itineraries). For KTA this is a good deal because the Kansas Turnpike operates as a ticket toll road and is far enough from Texas to handle relatively little Texas traffic. For OTA it is more problematic because OTA facilities are all barrier toll roads and handle higher percentages of traffic from Texas. My speculation, and it is only that, is that notwithstanding its signature on the agreement, OTA is resisting implementing it and instead seeking to negotiate bilateral agreements with the other Texas providers that bypass NTTA's interoperability hub and the processing fees associated with it. Is TxTag accepted at DFW Airport on International Parkway now? I almost tore off the gate thinking they would accept it. International Parkway is not a toll road; it's an airport access road. The charge is basically a parking fee that increases over time. It isn't a violation to use it as a toll road by driving straight across, but that isn't its intended function. I've read that if you get from one side to the other quickly, they charge more, $2 rather than $1, to disincentivize that use. Years ago, if you used a TollTag, they didn't charge more, but the pass-through discount was discontinued. TollTag, and only TollTag, can be used on International Parkway and to pay for parking at DFW and Love Field. The two airports are not toll authorities, and they accept TollTag only as a convenience for their customers. I know of no plans to extend that convenience to users of other tags. Thank you. Its funny watching everyone use the service roads to get around paying. Its easier going southbound through the Airport but virtually impossible going northbound. JN Winkler is correct, there is no way all the agencies could be merged, mainly because the rich agencies aren't going to want their funds siphoned and pooled with the poor/underfunded agencies. For example, the Harris County Toll Road Authority is swimming in money, allowing Harris County to consistently skim over $100 million per year in revenue ($127 million in 2018, $134 million in 2017) and use it outside of the agency. The agency had $754 million in revenue in FY 2018 (down from $803 million FY 2017 due to Hurricane Harvey and economic slowdown due to the oil price collapse), but its annual payment for interest was only $69 million and total expenses were $402 million. The agency's total liability is listed at $2.7 billion, or about 3.5 years of revenue. NTTA is also "rich" but I don't know any specific financials off the top of my head. 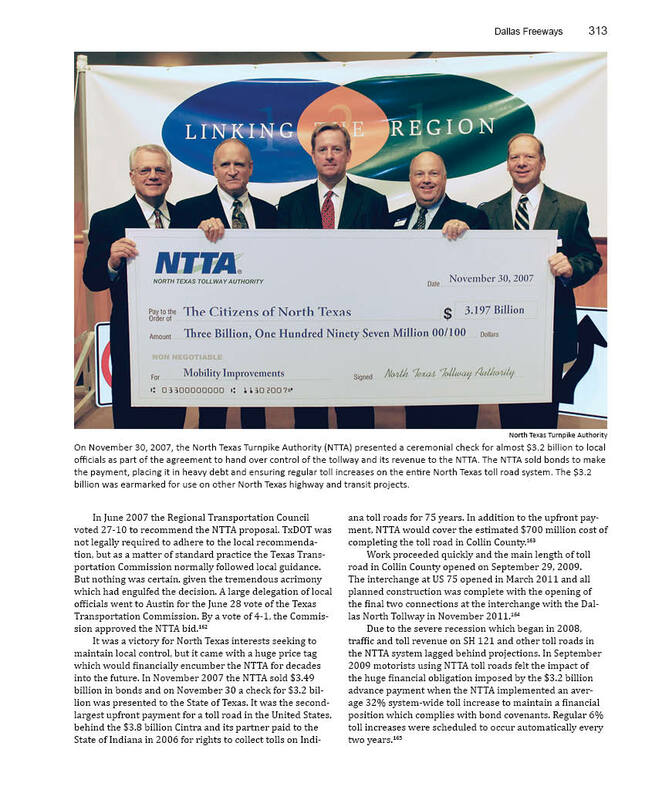 NTTA has monetized future revenue by making the massive concession payment for the SH 121 Sam Rayburn Turnpike, so they don't have as much free cash as Harris County. Even on the local agency level, profitable toll roads subsidize unprofitable or marginal toll roads. A single statewide agency would basically cause toll payers on busy facilities in affluent areas to subsidize other projects statewide which never should have been built. This conversation is really interesting because Toll roads in Texas is just a very complex thing and weird when you think of them. While working for TXDOT, I have found this presentation and it kind of sets the standards of what toll roads should be like in the state. 1. Toll roads can constitute anything and don't have to follow interstate standards as long as it is an independent road. 2. If a toll road is built on an existing highway, that highway must become the frontage road, if an interstate, the toll road becomes an express lane or lanes. -EXAMPLES: I-635, I-10, US 290 etc. Even if all the toll road agencies in Texas are never merged there is still no valid excuse for them to continue avoiding a single unified toll tag standard. There should be one single standard nation-wide. For me it's no different than making everyone drive on the right side of the road. It's no different than various credit card companies using the same size/design of cards. The best I can figure from a customer/driver point of view is all these different toll road agencies are either trying to protect some kind of ego-driven turf or they're trying to figure out ways how they can price gouge non-local drivers more than people who have their local system toll tags. It smells like a bunch of good ole boys network horseshit to me. Credit card merchant fees are a fairly standard thing. There needs to be some unified, consistent, no-games, national standard on what toll road agencies charge for any admin burden they suffer from non-local drivers using their roads. Or maybe there just needs to be an independent national processing hub for all toll road transactions to remove that excuse from all the little toll road agencies scattered all over the place. For some reason, I look back at the Grand Parkway as a Prime Example of multiple tolling agency working together. Now Grand Parkway (Might as well be Grand Houston Turnpike). But it trully depends on what part of the state you live in. If you live in Houston, you get the EZpass, if you live in Dallas, you are incurraged to pick up the Toll Tag, elsewhere statewide, you are wanting to get the TXTag. The most powerful toll tag in the state is the Toll Tag no question as it has power not only in Texas but in Oklahoma and Kansas plus the DFW & Love Field Airports. Why do I think the TXDOT TXtag works in Kansas but not in Oklahoma. I think the KTA made the deal with TXDOT directly and not the OTA. And somehow, because the TXtag works statewide, somehow there must be some chip in our toll tags that takes the same software I don't really know but because of that all the toll tags in Texas work in Kansas. But the OTA spoke with the NTTA and because of that, the NTTA's tag will still be the most powerful. Now yes, I think that should change and just unify our agency together and separate the Toll Operations Division from TXDOT and make that its own agency itself. The Agency's job would be separated into districts to focus on localized projects and the money made from the toll roads would go back not just into the road but any extra should go to the cities that need it to maintain their own roads. Then we could lower our gas tax a little.